X-EDITION High Quality and Secure USB Wall Charger is compatible with most USB devices. and More Mobile Phone, Tablets. - Interface: adopt the integrated injection molding technology, stronger and durable. 【Safe Charging】: Use PC fireproof material, Provide multiple protections, including: Output short circuit, built in over-current, over-voltage and over-heating protection etc. X-EDITION'S USB Wall Charger has undergone 100% burn-in tests, extending the service life and charging more safety. Automatically stop charging when the battery is full. 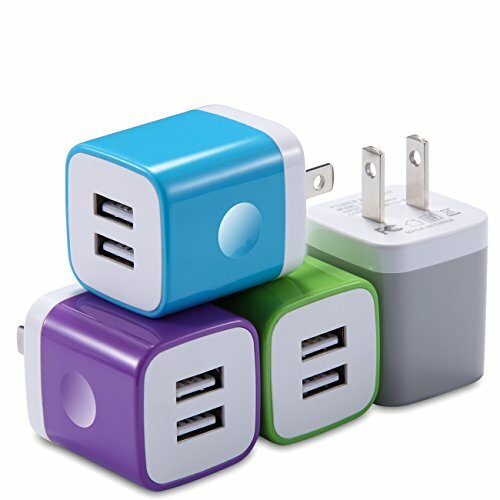 【What You Get】: 4-PACK USB Wall Charger (USB Power Adapter), Within 30 days unconditional refund guarantee, 12 months warranty and friendly customer service. If you have any questions about this product by X-EDITION, contact us by completing and submitting the form below. If you are looking for a specif part number, please include it with your message. tzumi HyperCharge 10-Watt Wireless Fast Charger Pad for Qi-Compatible iPhones, Androids, and All Wireless Charging Smart Devices – for Home and Office. Includes Qualcomm 3.0 Quick Charge Adapter.